I didn't want 2010 to end without paying a little homage... I wasn't on time, but better late than never! 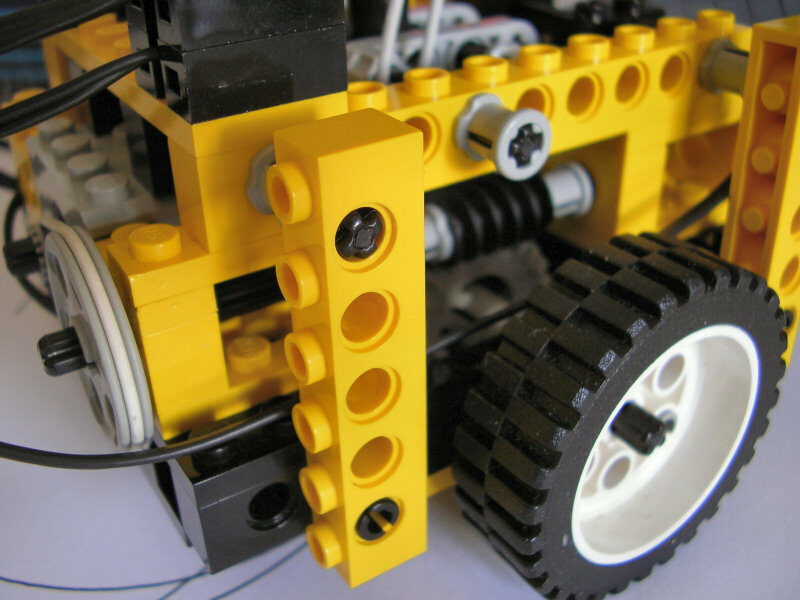 A very significant thing happened in the LEGO Technic world twenty years ago: the replacement of the 4.5V system (featuring elements like the Electric Motor) with the 9V elements that made their first appearance in the previous year. 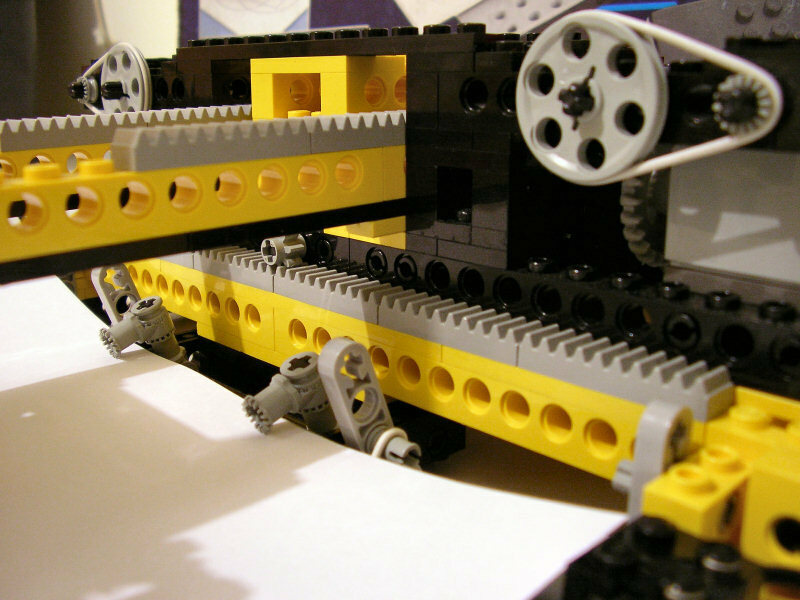 This system would last for another 17 years, and was applied to practically the entire LEGO range, including trains, City, Space, MINDSTORMS and of course Technic. 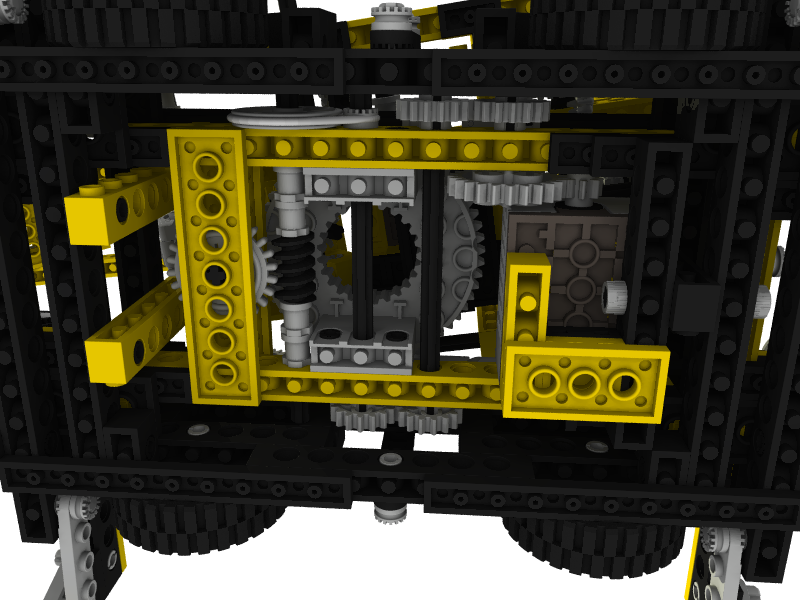 And what better way to showcase the new electrical system than with a set that completely broke (and still breaks today) with what Technic fans were used to get? So, let me introduce to some and remind to others this set, one that has become "Vintage" this last year but hasn't become a bit outdated: the 8094 Control Centre. 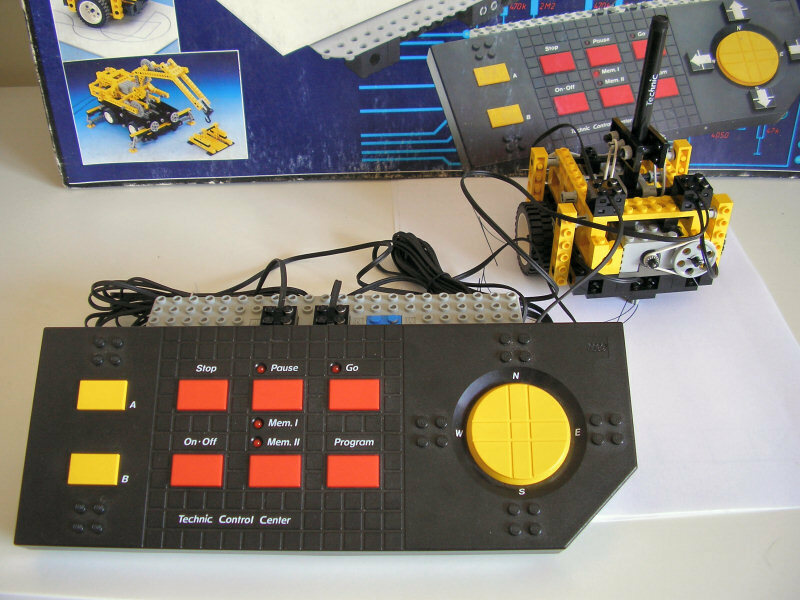 The Control Centre unit is a microcomputer embedded in a LEGO carcass. 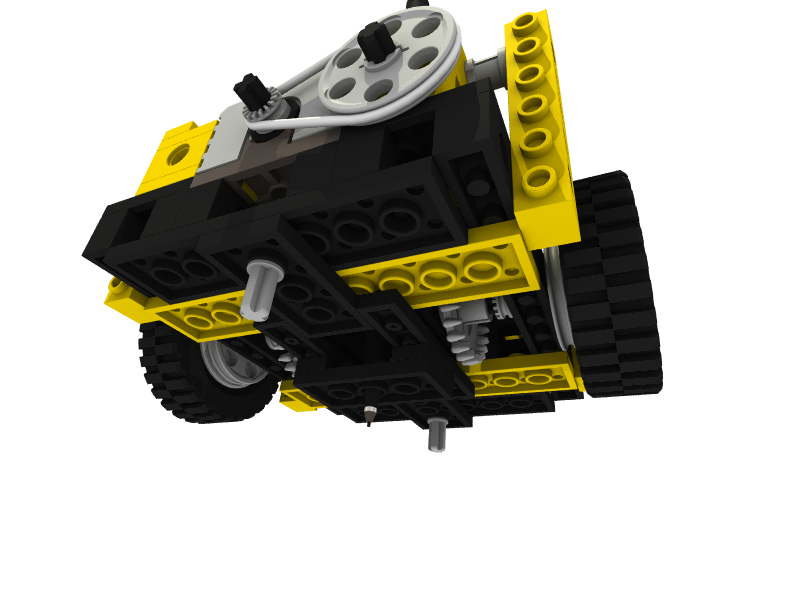 It is powered by 6 C batteries (an updated version, unimaginatively called "Control Centre II" and launched 5 years later, added the option of being powered by a 9V LEGO Train transformer), although it can, with some dexterity, hold AA batteries instead. Its interfaces to the outside world are three motor (or light, or sound brick, or whatever 9V-powered element you want) output ports, some LED lights to tell you what it is doing, and a set of user controls. These user controls allow you to give commands to the Control Centre: directly control the motors, teach it sequences of actions, or tell it to playback previously memorised sequences of actions. 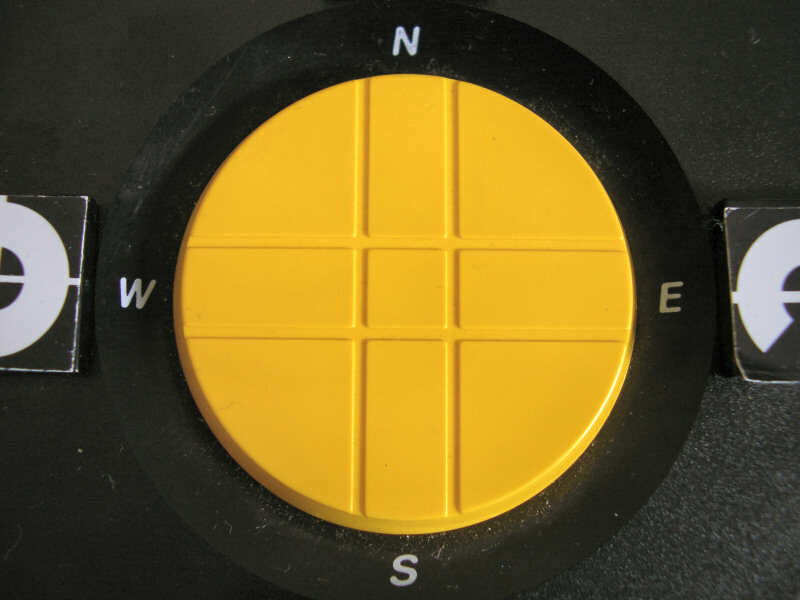 You give commands to the Control Centre's motors (both directly and while teaching it a sequence) by using the big yellow "N/S/E/W" round button on the right and the two smaller "A/B" buttons on the left. 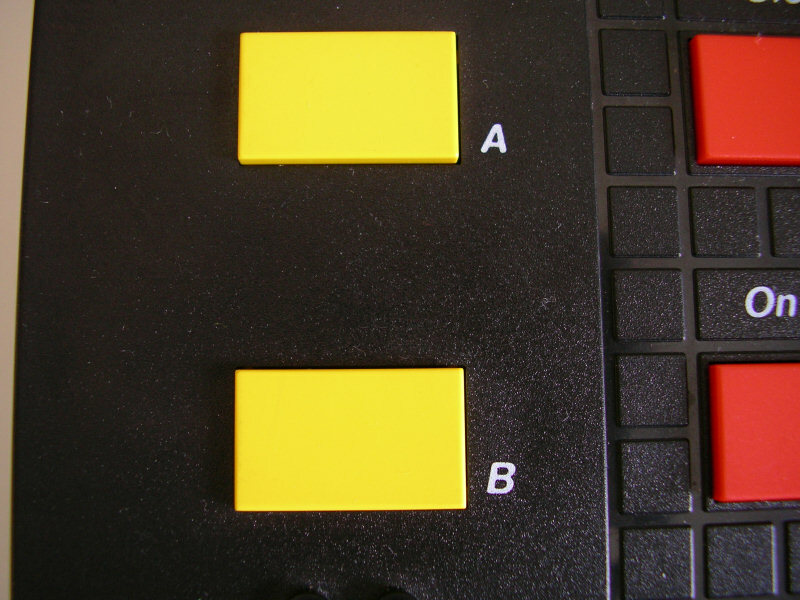 As can be expected, they control power to the outputs marked "N/S", "E/W" and "A/B", respectively, on the rear. It is to these outputs that you connect your motors or other 9V thingamabobs. How do you teach the Control Centre sequences? 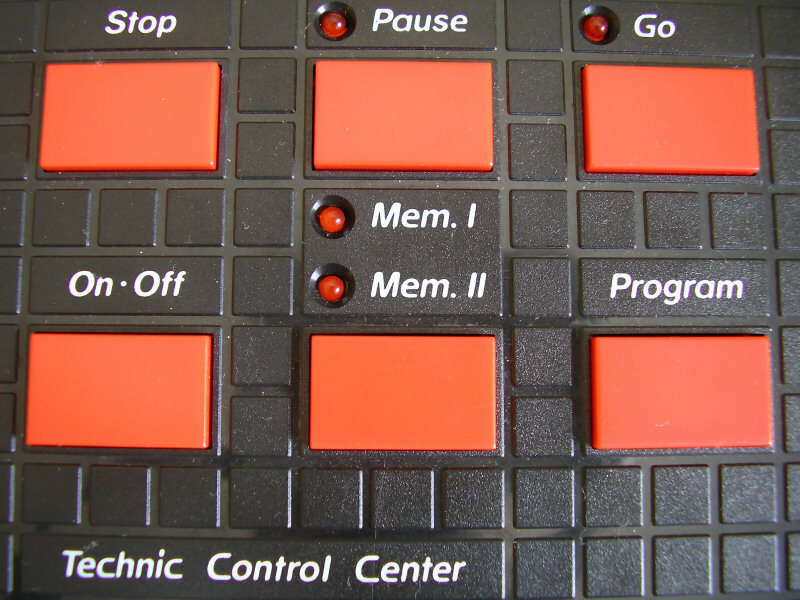 Using the "Mem" button, choose either of the two program slots to store the new sequence in, and long-press the "Program" button until the selected program slot's LED starts flashing. Now you can use the output controls to move your model in any way you like, and the Control Centre will remember all the steps you take (up to a certain number of them, of course; the most I managed with the Plotter model was 39). When you're done, just press the "Stop" button and the sequence you recorded will be on the Control Centre's memory until you overwrite it with a new sequence or take out the batteries for a long time. Now that the Control Centre has a sequence stored, it can play it back. Select the stored sequence you want to play with the "Mem" button, press the "Play" button and watch it go! It will light up the "Play" LED and repeat almost perfectly (I'll explain later the reason for the "almost") the sequence you taught it earlier. If you prefer, you can tell it to play back the sequence indefinitely until you tell it to stop; in that case, you just have to quickly double-tap the "Play" button instead of simply pressing it, and the "Play" LED will flash to indicate continuous playback. Speaking of stopping the sequence, you can do so by pressing the "Stop" button. The next time you hit the "Play" button, the Control Centre will play the sequence from the beginning. If, instead, you just want to briefly pause the sequence to later resume it when it stopped, press the "Pause" button instead. The "Pause" LED will start flashing to tell it is waiting for you to press the "Play" button again to resume. Now, why did I write earlier that the Control Centre played almost perfectly the sequence you taught it? Because it doesn't play it perfectly, of course! For two reasons. First, it ignores how much time it is stopped between steps: for example, if you teach the Control Centre by moving your model forward, waiting a bit, and then moving it backwards again, the Control Centre will move forward and then immediately reverse direction. Second, it records each sequence step by storing how much time it should keep the motor(s) running in that direction. 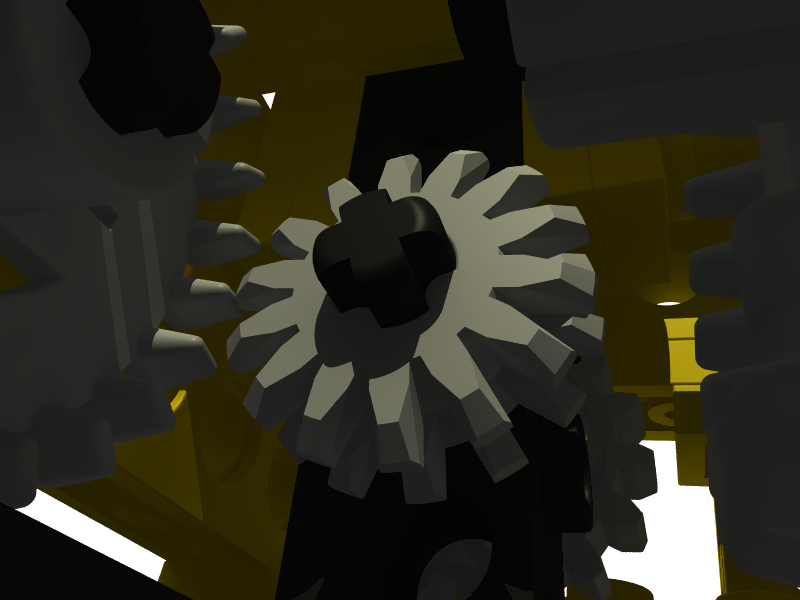 As the batteries run dry and the motors run slower, or if something unexpected like a wall, a jammed paper or a curious cat prevents the model from moving, the Control Centre has no way of knowing it and will keep moving the motors for the specified time intervals, possibly ruining the sequence you so carefully planned. 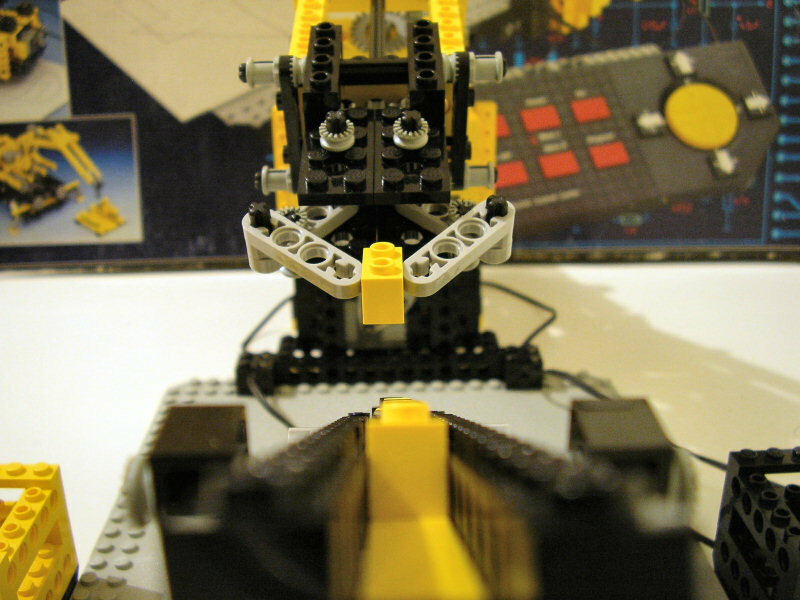 This lack of feedback is the main distinction between the Control Centre and a true robot with sensors, such as those that would appear later with the MINDSTORMS line. There are ways of going around this limitation, of course, and applying them to your creations is part of the fun! Now that the introduction to the Control Centre unit is done, here's a brief description of the models that can be built from the parts and instructions that came with the set. You'll notice I didn't describe in detail the mechanisms each model features and how they work: I've done it deliberately, since there is already an inimitable source for all the detail you may want, for the whole history of LEGO Technic, and therefore I'd be redundant: Technicopedia, which you can find here. 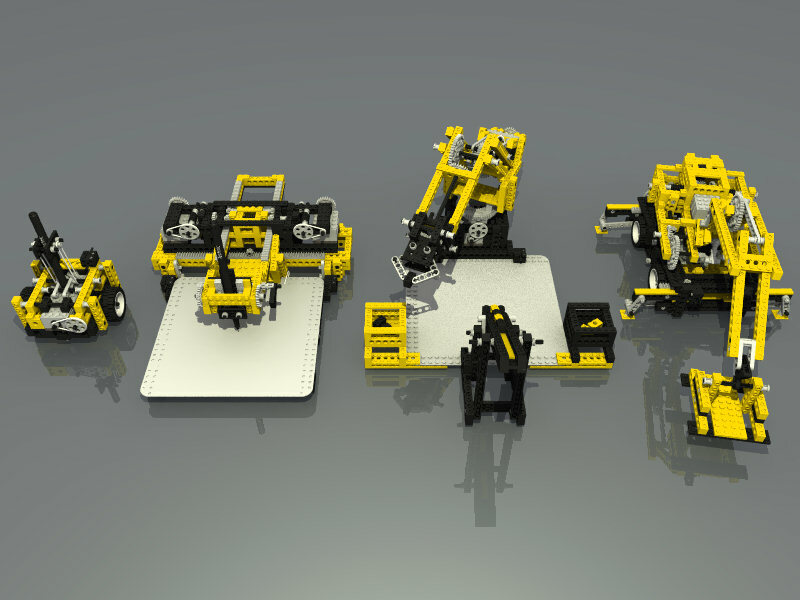 I'd like to thank Blakbird, Technicopedia's creator, for having created the Mobile Crane model and allowing me to use the LDraw files on his site to create the computer renders in this post, and Benjamin Wendl for having created the rest of these complex files. On each model's description, you'll find a reference to the relevant section on Technicopedia. First of all, there's the "Turtle" robot. Its functionality is the same as the Logo Turtle: it moves straight or rotates around itself (it can also do a combination of these, something the Logo Turtle can't), and it draws a line on the surface on which it moves (preferably a sheet of paper and not an expensive marble floor!). With some practice, you can have it making line drawings. 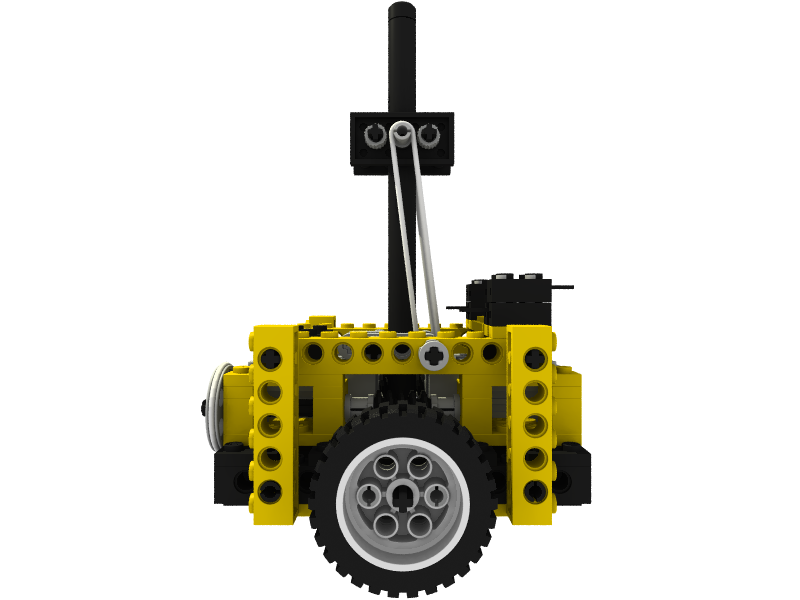 It works by having each motor independently connected to its wheel, thus forming a differential drive. 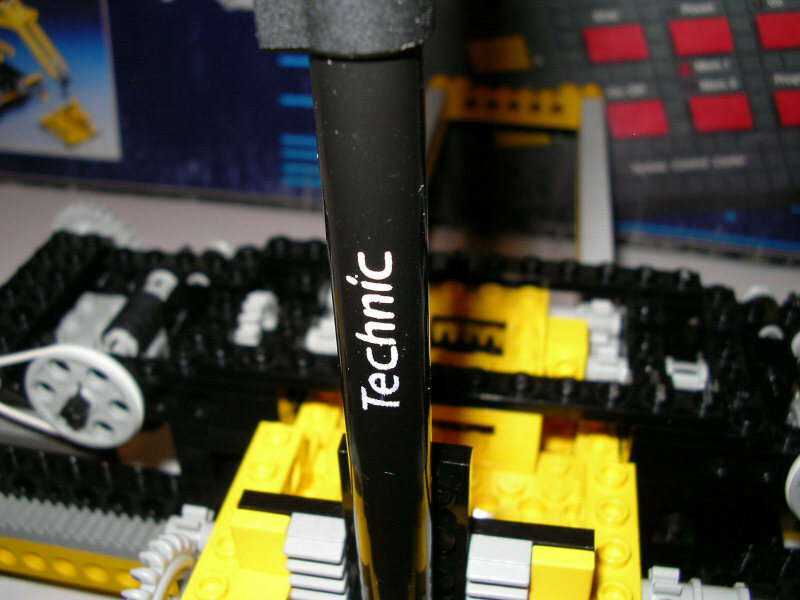 The Technic pen, which is another exclusive in Technic, is attached to the centre of the robot: this way, when the robot rotates over itself, the pen stays in the same place. 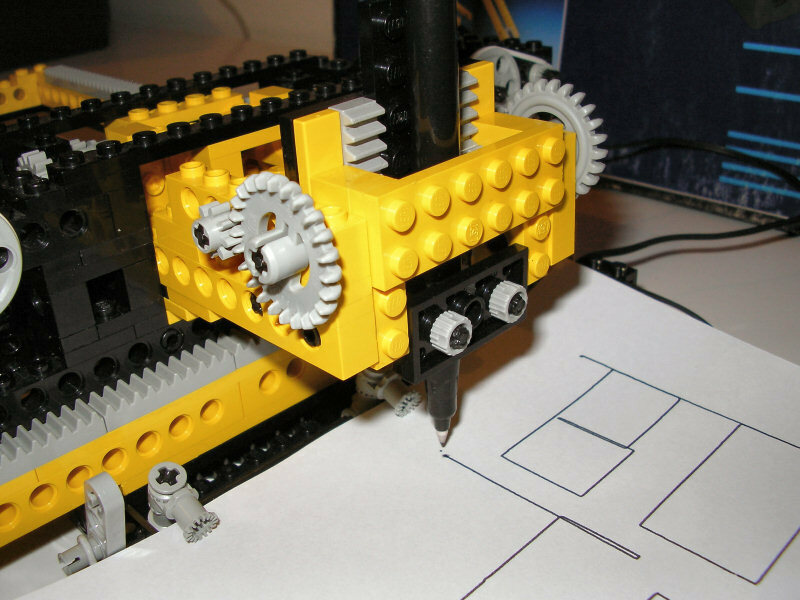 Since the set (and therefore the robot that you build from it) only comes with two motors and those are taken by the locomotion function, the pen is fixed against the paper and can't lift from it: thus the drawings you make with this robot always consist of continuous lines. This is a limitation the Logo Turtle doesn't need to worry about. Next, we have the Plotter. 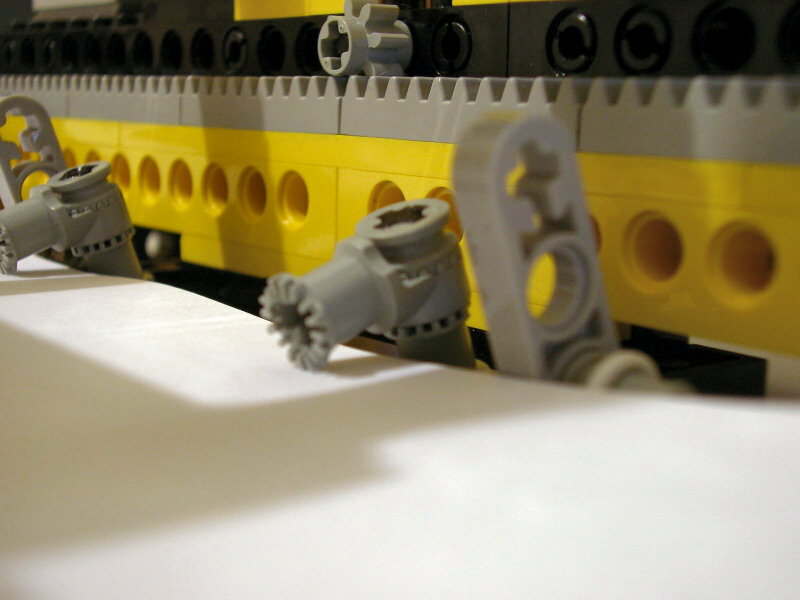 Like the Logo Turtle, it uses the Technic pen to make line drawings on a sheet of paper. However, it does that in a different way. An interesting detail the Plotter has is a pair of tiny rubber-band-based retainers, to hold the paper against the base and prevent it from being dragged by the pen. Next is the Mobile Crane. 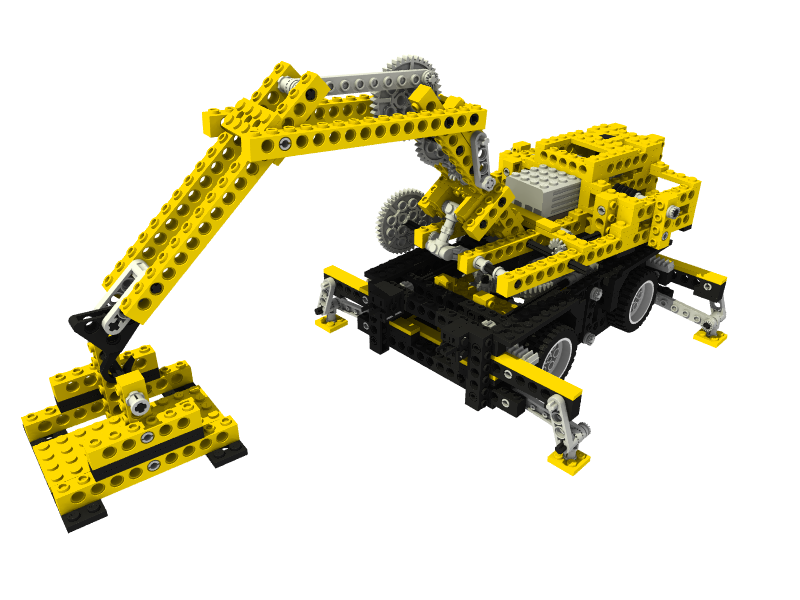 Sure, you certainly have already seen a gazillion Technic mobile cranes, but how many of them are programmable, and using two motors to implement three functions? 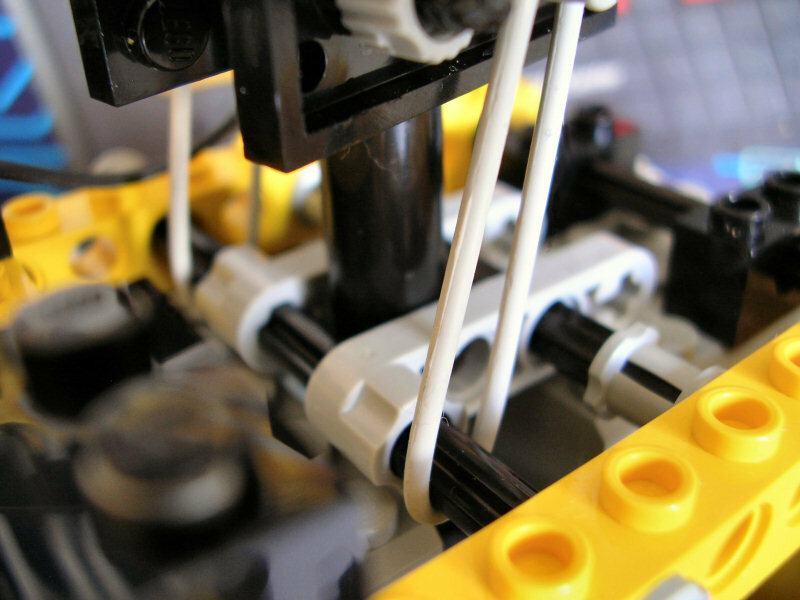 You can push the Mobile Crane around (in a straight line only; it has no steering) while making "vroom vroom" noises and deploy and retract its outriggers, but the real attraction is the rest of the functions it performs under the command of the Control Centre. 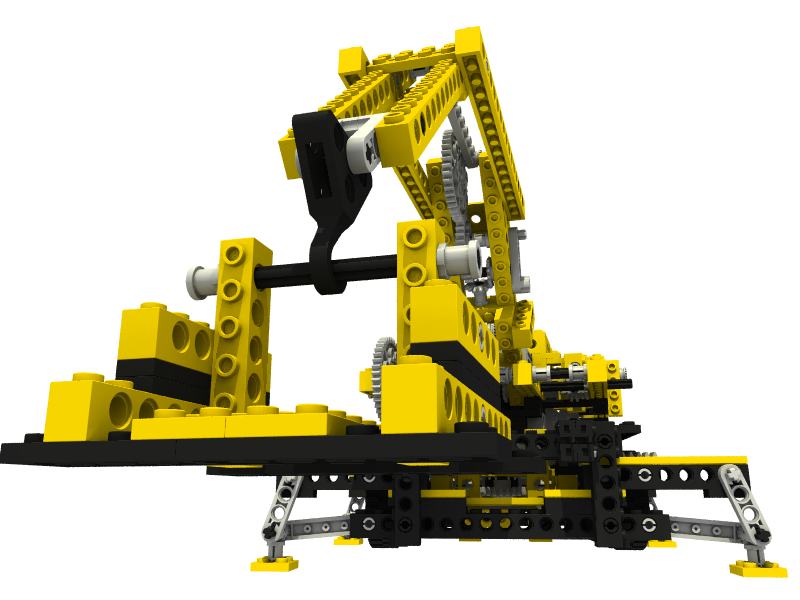 There is a motor for superstructure slewing, and another for raising/lowering both the arm boom and jib. 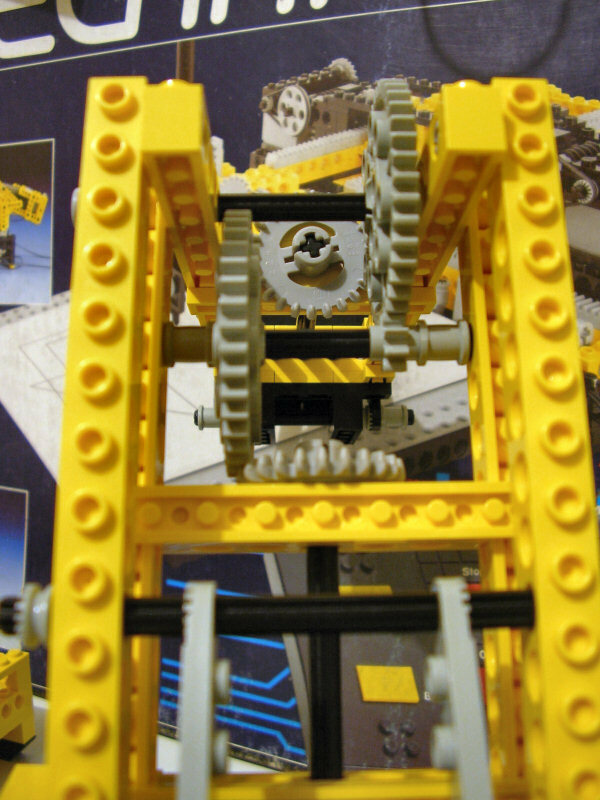 The way rotation is achieved is relatively straightforward, with one of the motors connected to the superstructure's turntable via some gears and a pulley. 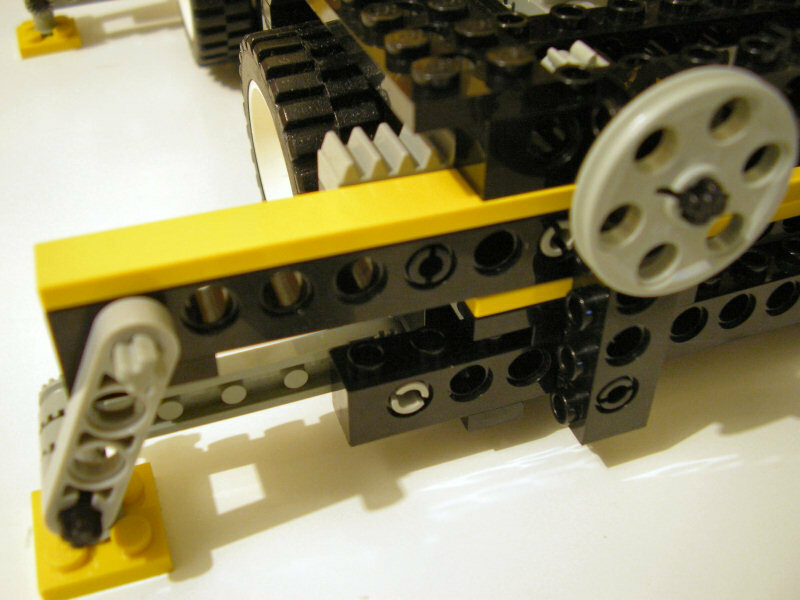 The most interesting mechanism is a little above, with a pendulum to split (technically called "multiplex") the other motor's movement between two different functions. When the motor switches direction, first the pendulum swings to engage the other function, then, unable to move further, the function itself starts. In the video, pay attention to the small black square at the top of the superstructure, towards the rear: it is the tip of the pendulum, swinging as each function engages. Of course, one can't make omelettes without breaking eggs: and, in this case, the eggs are the limitation of each function being able to work in only one direction. One direction of the motor handles the boom, the other the jib. 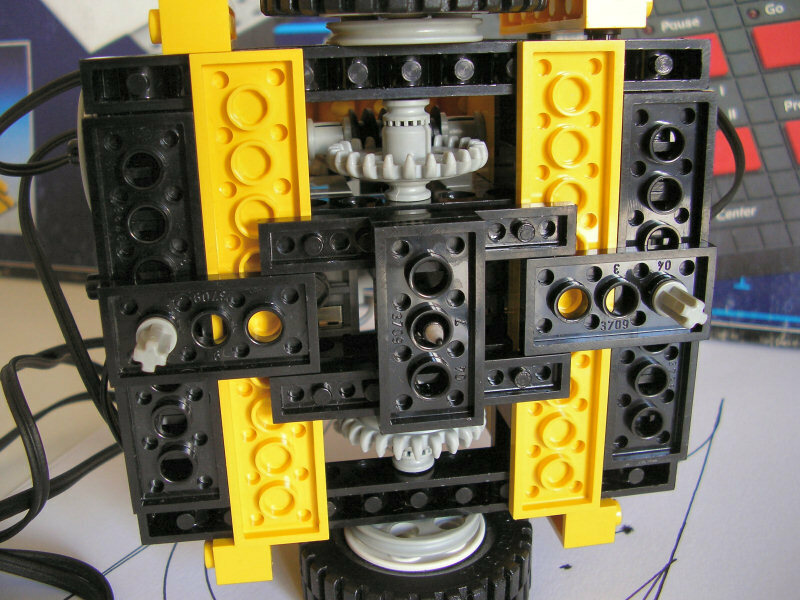 That's why both sections of the crane have a mechanism that transforms the (single-direction) rotation from the motor into a back-and-forth motion. Finally, we have the Robotic Arm. 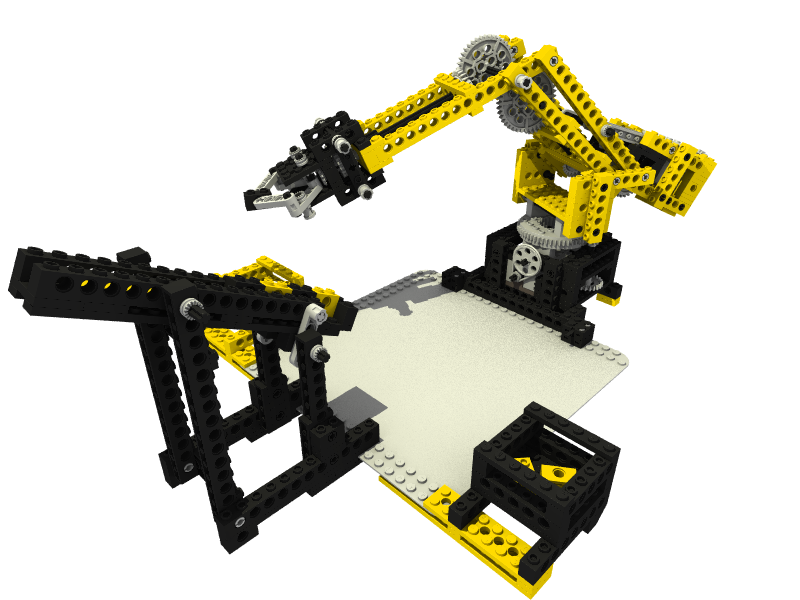 Like the Mobile Crane before, it manages three functions with only two motors: rotating around the base, raising/lowering the arm, and opening/closing the claw. 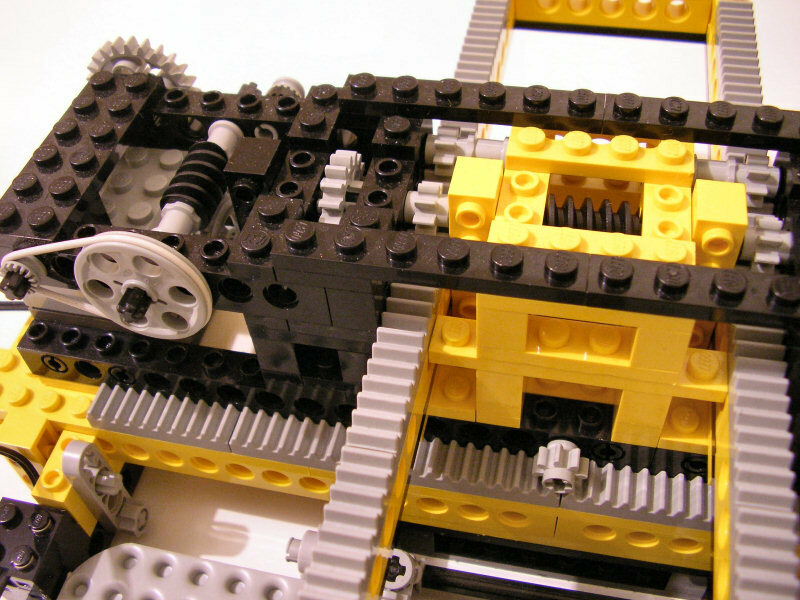 It can pick up coloured bricks from a chute and sort them into different containers. 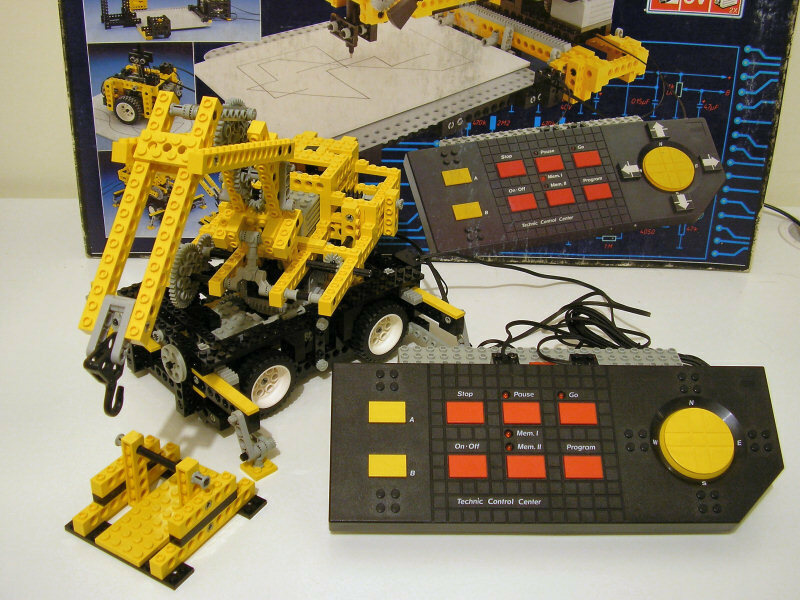 Since, unlike previous Educational Division-exclusive sets and the yet-to-come MINDSTORMS line, the Control Centre can't use sensors to see what colour is each brick it grabs, it relies on the pre-defined sequence the bricks are placed in the chute to be picked up. Still, the Robot's action is always fascinating to see. 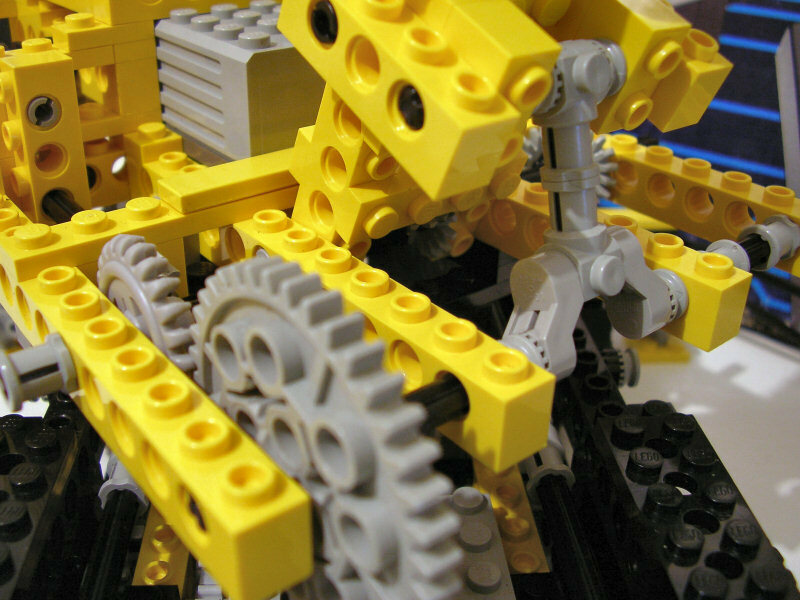 It uses a different solution to the problem of function multiplexing than the Mobile Crane, relying on the path of least resistance mechanical contraptions (and not only mechanical) tend to follow. 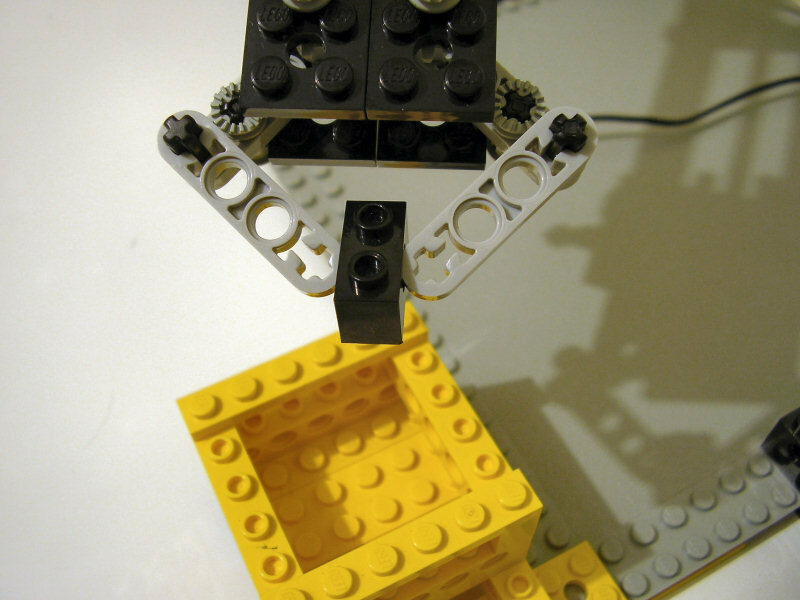 The Robot's functions are linked in a way that the claw closes and the arm rises with the same movement of the motor. 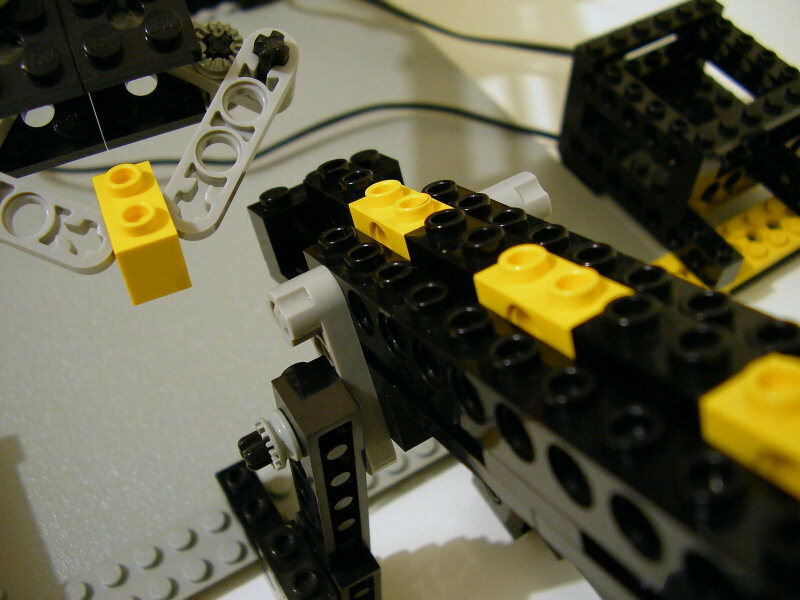 With the arm resting down, it is easier for the motor to close the claw than to raise the arm, and that's what it does. 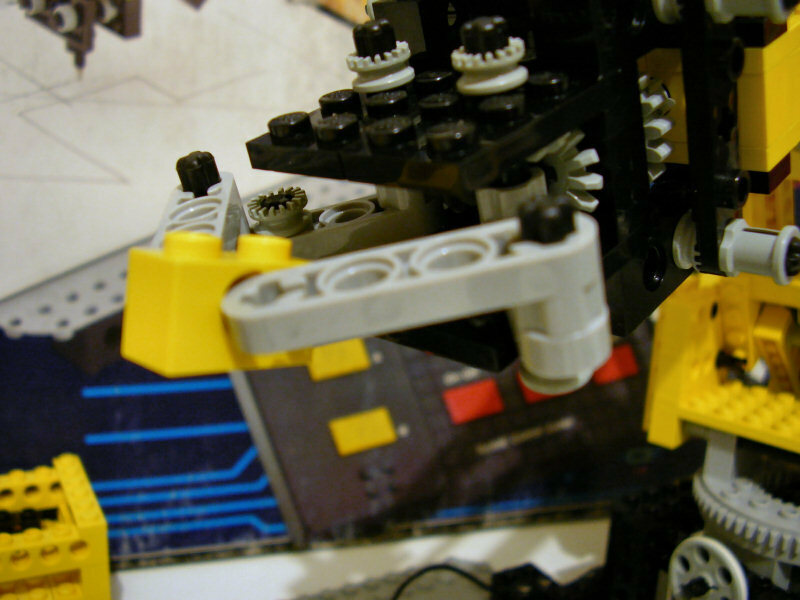 Then, when the claw can't close any further (either because it is really fully closed or because a brick was grabbed), the motor has no other solution than to raise the arm. When the arm is up, it is easier to lower it (since gravity is helping) than to open the claw. Only when the arm is fully down, then the claw opens. While this may sound limitative, that's usually what we want: lower the arm, open the claw, grab something with the claw, raise the arm, reposition the arm (in this case by rotating it), lower the arm, let go of what was grabbed. 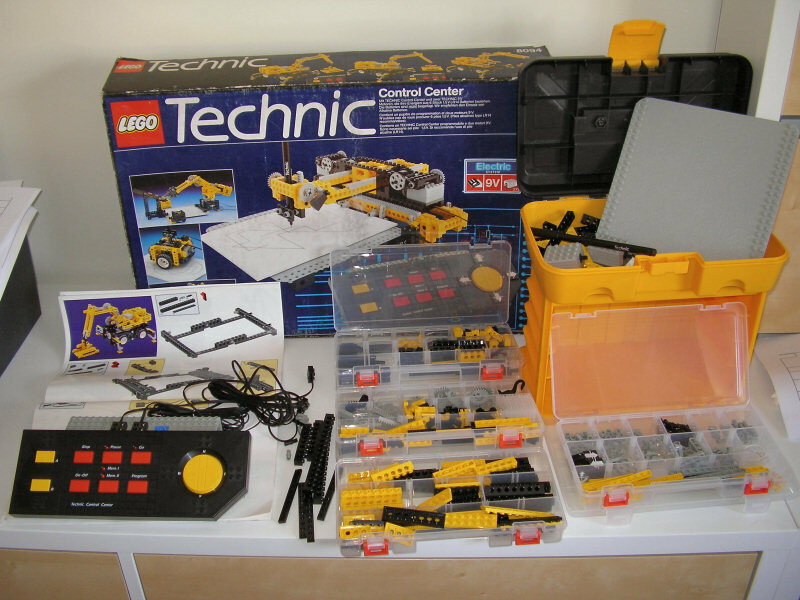 I think this set deserves a high place on every Technic collector's list: its models are still unique to this day, it marked the beginning of a big evolution of the LEGO toy (both the 9V system and bringing the first tastes of robotics to the masses), and now it is officially considered a "Vintage" set. Looking back at the developments consumer electronics and LEGO Technic enjoyed in the last 20 years, especially the inception of the Power Functions system, I fully agree with Fernando when he said, regarding the 8485 Control Centre II, that a new, PF-enabled version would have great potential and wouldn't be very difficult to make. More advanced than "dumb" remote-controlled models, yet easier and quicker to play with than MINDSTORMS, it would certainly nourish the imagination of both kid and adult FOLT (Fans Of LEGO Technic ), and, who knows, perhaps be what gets future roboticists interested in the subject for the first time! Let's see what we can write about the subject 20 years from now. An incredibly well written and well photographed nostalgic visit of this set. Thanks for this. I think it will inspire some people who have never seen it before (and that's most people). Not that it really matters, but I actually made the mobile crane LDraw file myself. Benjamin made the others as well as creating the dat file for the pen. I feel all nostalgic now! Thanks! Wish Lego would bring out some more Universal sets again! Which allow you to easily convert more common AA Batteries to the C size. Definitely a great post Alexandre. Thanks! when it came in 1998. 50 years ago the abs bricks were a physical approximation to the 3d grid spaces, technic approximates what CAD programs try to do ant these control centres... wow, how explain,they were most advanced "toys" of history, more than nowadays mind controlled balls or other recent kids stuff. Thanks for this post, now my mission is to get one and build an awesome GBC!! 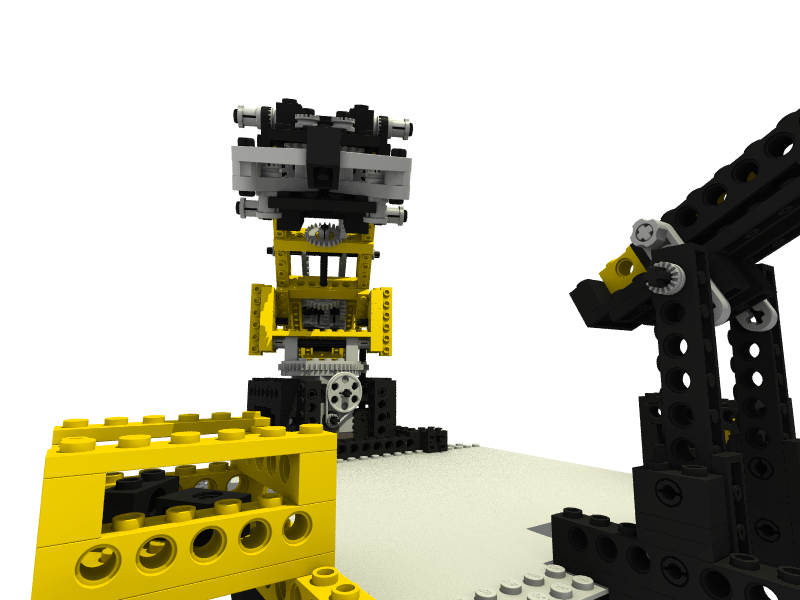 It will be very interesting if lego make something similar nowadays.NXT is IMHO little boring and much complex. @Blakbird: thanks for the heads-up! I have corrected the post, as well as added the links to the models in Technicopedia, which I had forgotten. "[...] and also the Record and Play module, the Scout and the Micro Scout... "
Micro Scout "add ons" to the RCX? I think that you made a real good job with this posting. Actually, the R&P module is like a "light" version of the Control Centre, with 2 4.5V integrated motors instead of 3 9V generic outputs, and you program it by directly moving the model instead of pressing buttons. 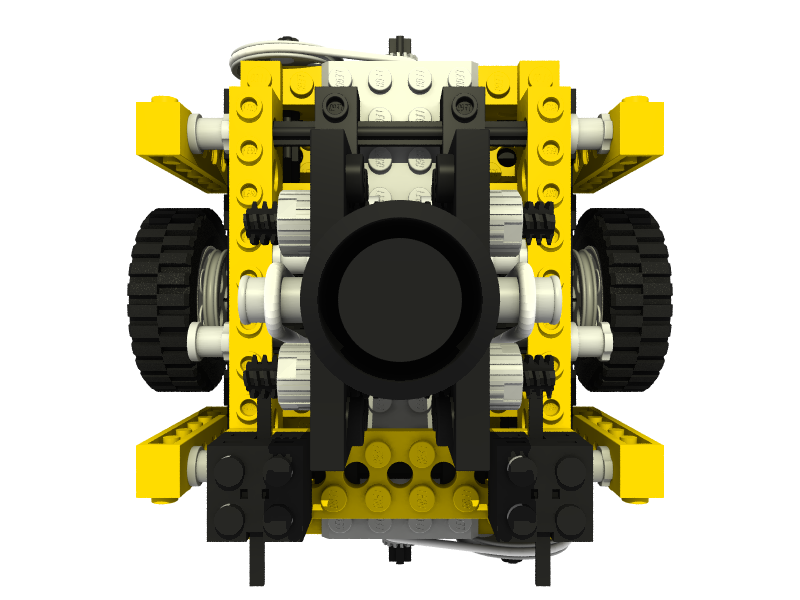 As for the Scout and Micro Scout, they're independent programmable bricks like the RCX and the Cybermaster, only with some limitations. Oh, and on the "evolution roster" there's also the Spybotics brick missing... quite a long history of LEGO programmable bricks! Spybots indeed: alhough not branded as Mindstorms, they have quite some programming capabilities! 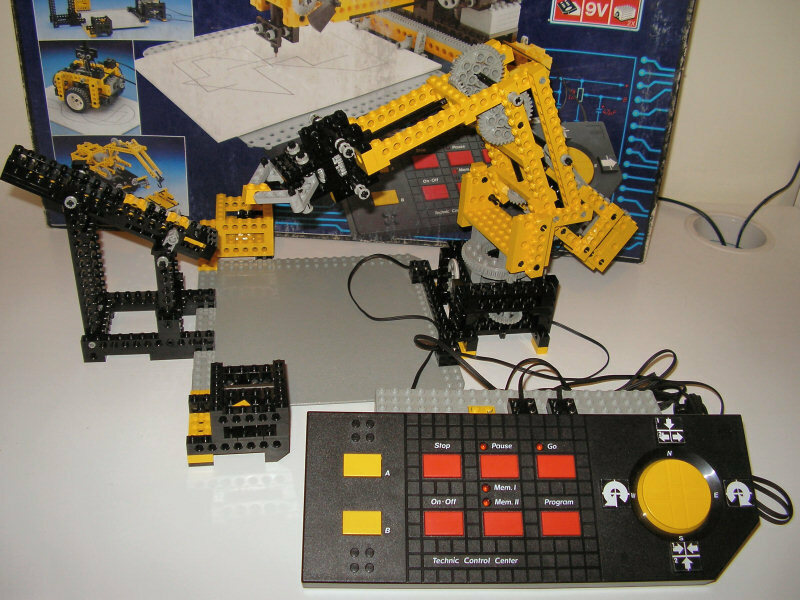 You could also add the programming interfaces (A and "B") which appeared through LEGO Dacta. I have never seen an Interface A personally, but I do own a Controllab Serial Interface ("B") and it is a very interesting piece of technologie as well. I remember getting that set and not being able to sleep. Now, like so many other things, it just sets in the original box as a great memory. 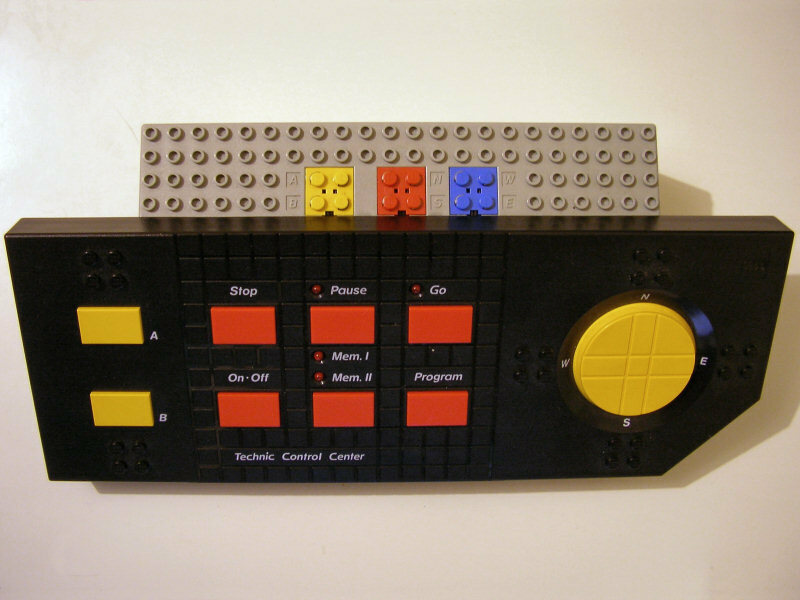 The WeDo would be the closest thing to Command Center that Lego currently sells. 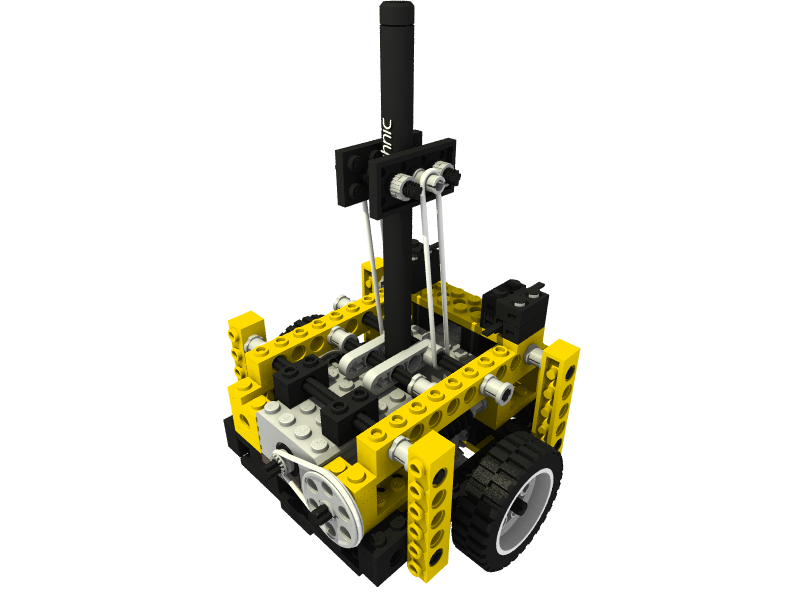 Now all they have to do is get WeDo to work with Mindstorm sensors and servos, and get RobotC to work with it! 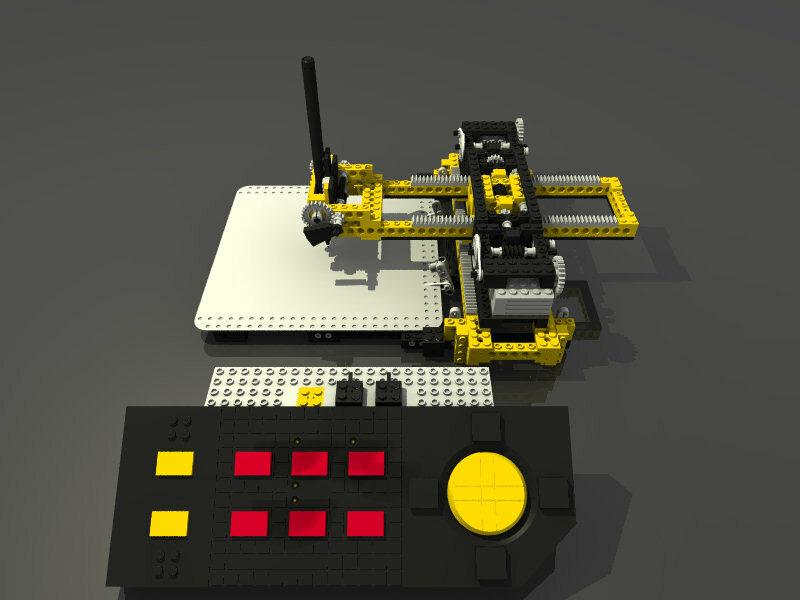 @mike k - WeDo is a very different product than the NXT... unfortunately. 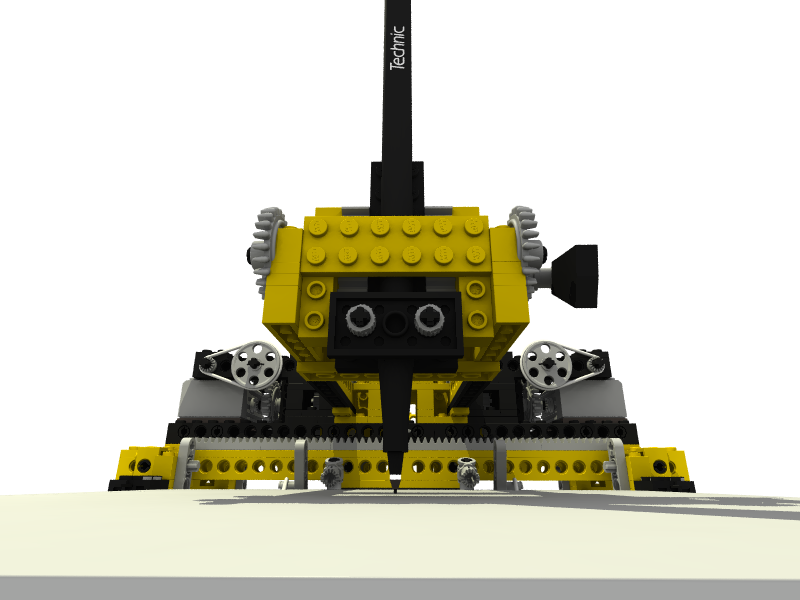 I would have loved to see a system that could grow, starting small and adding functions and possibilities as you move on, but, as it is, WeDo is a bit of a dead end and it won't interface with any NXT elements. The NXT motors use the same electrical motor as the PF XL motors. Those draw quite some current and there is only so much current you can draw from a USB output. 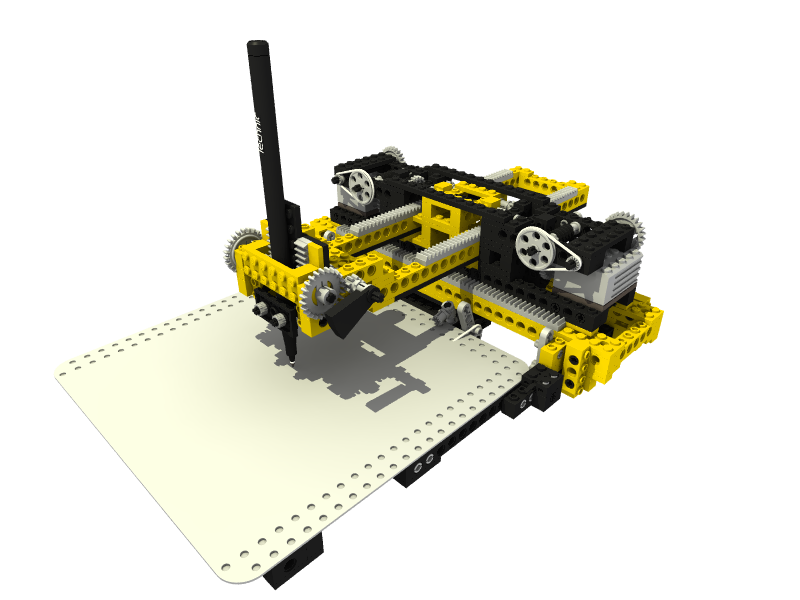 There are alternative programming languages available for WeDo, including Scratch and a version of Lua. The Micro Scout controller (as used in 9748 Droid Developer Kit)is very limited, but it's essentially a programmable brick, even though you have to select from a list of given functions on the LCD.